Emesent co-founders Stefan Hrabar and Farid Kendoul. Autonomous drone start-up Emesent, led by former employees of CSIRO’s Data61 technology division, has received $3.5 million in capital investments for its Hovermap system. 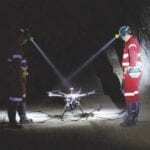 Hovermap is designed for automated data collection via drone in dangerous underground areas. Last year, the team was responsible for the first fully autonomous beyond line-of-sight (BLOS) drone flight in an underground mine. This took place 600 metres below the surface in Western Australia. Emesent co-founder and chief executive Stefan Hrabar said, “Hovermap enables the mining industry to safely inspect inaccessible areas of underground mines while improving the type and quality of data collected to unlock new insights. The LiDAR-equipped Hovermap has already been deployed at operations in Australia, the United States, Canada, China and Japan in various capacities, and is currently being rolled out as part of a new program designed to target the underground mining sector. CSIRO chief executive Larry Marshall said Emesent was a company that “hit the innovation sweet spot” by combining digital expertise with mining experience. “This has been harnessed by the environment we have created at CSIRO where deep science combines with innovative ideas and agile minds to create game-changing technologies,” he said. Capital raising for Hovermap is led by CSIRO’s innovation fund Main Sequence Ventures.